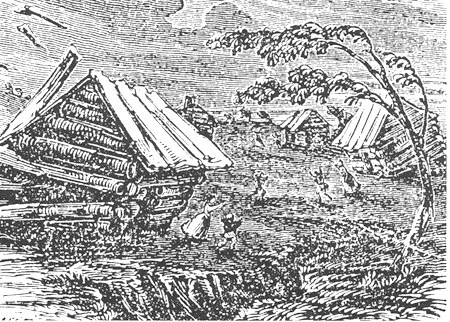 On December 16, 1811, a major earthquake occurred with its epicenter in the town of New Madrid (now in the state of Missouri). The Roosevelts and the crew of the New Orleans were about 200 miles from the epicenter on December 16, and they felt the shock distinctly. (It was discernible as far away as Boston.) It caused enough damage to change the shape of the Mississippi River, meaning that they traveled through miles and miles of uncharted waters. The tremors continued for more than a year, with the three largest ones (with magnitudes between 7 and 8) occurring in the first three months. The U.S. Geological Survey offers more detail on the New Madrid earthquakes. Dec. 27, 1811, Pittsburgh Gazette - report of the Dec. 16 earthquake (from Lexington, Kentucky) -- apparently Nature can "no longer tolerate the moral turpitude of man"
Feb. 1, 1812, Western Spy - more "comparatively light" shocks felt in Cincinnati, and "it now appears the earthquake has been felt along the Atlantic coast as far as N. Jersey"
Feb. 8, 1812, Western Spy - on Feb. 7, Cincinnati was "seriously alarmed" by a shock "far more violent than any before experienced"
Feb. 22, 1812, Western Spy - observations about earthquakes, copied from the writings of "Dr. Wittich"
Apr. 4, 1812, Western Spy - Jesse Hunt gives eyewitness account of February's earthquake damage from New Madrid to what is now Memphis, Tenn.